Anyone who has read my car reviews with a good memory may actually remember my first car was a Volvo 340. My silver dream machine was quite old but that didn’t matter- it was my first car and I was proud as punch of it. The electric windows didn’t work and it wasn’t very economical at all but I do remember the car having great seats and it being built so strongly. Another thing I still remember to this day were the daytime running lights, only Volvo and Saab drivers would have their side lights on no matter how bright it was. With LED running lights this wouldn’t be so unusual now but 25 years ago other drivers would flash you as they didn’t realise you had no control over them whatsoever. Let’s fast forward to 2016 though and I can tell you I’ve been very privileged to drive the new S90; this car is aimed at the BMW 5 series, Jaguar XF, Mercedes E Class and the Audi A6. The previous Volvo was a firm favourite for taxi drivers and the police loved the sporty T5. This car was launched over 20 years ago, was always a boxy looking car and it still hasn’t lost the box styling but is far more cooler now and totally different to its competitors. Volvo is currently on a roll with the XC90 still selling like hot cakes, this doesn’t surprise me at all because it’s a fantastic car. 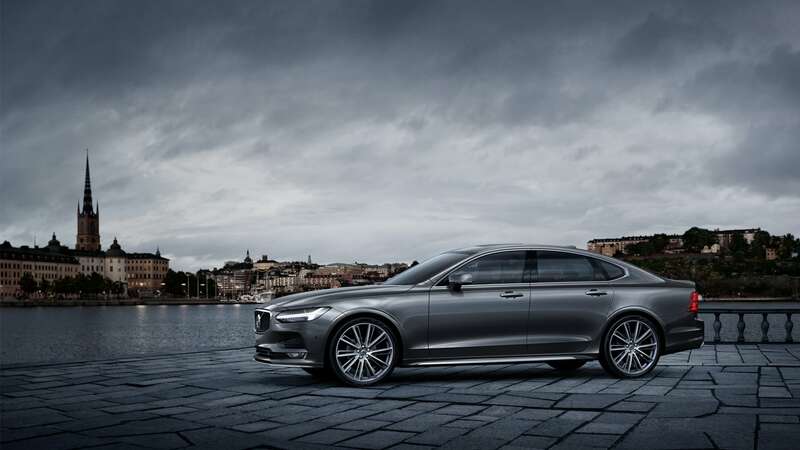 With that in mind, I had very high expectations for this new S90. It’s based on the same chassis as the XC90 so Volvo should have another winner on its hands. The S90 is being launched with 2 diesel engines. The first is the D4 which is a four-cylinder 2lt engine which gets to 62mph in 8.2 seconds and it emits 116g/km of co2. The other engine that is badged D5 and that gets to 62mph in 7.3 seconds this engine only comes with four-wheel drive and emits 127g/km of co2. There are also two petrol engines but they won’t be coming to these shores. 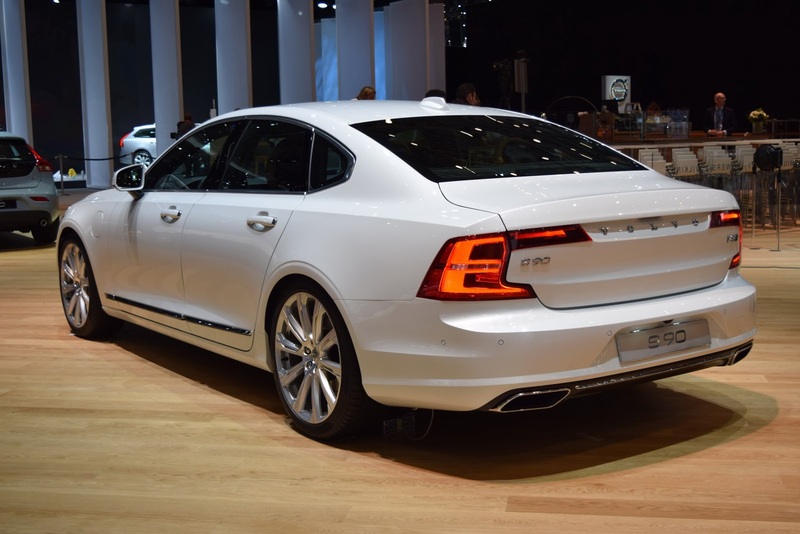 A hybrid S90 should be interesting as it has 402bhp and it emits a measly 44g/km of co2. Unfortunately I didn’t get a chance to drive this plug in hybrid but I do think this car could really be the pick of the range. It will be great to see what the designers have up their sleeves with the R Design as this will turn the cars from slightly frumpy to full on sporty. The car has been priced slightly higher than the equivalent 5 series which is a very bold move indeed. The base car is priced at £32,555 with the range topping car costing £45,000. The car has two trim levels. Momentum is the equivalent of BMW’s SE. Cars come with leather, dual zone climate control, LED headlights and a 9″ infotainment screen which dominates the dash. The top spec is Inscription which adds diamond cut alloys, nappa leather and a bigger display between the instrument dials. The cabin really is beautiful, the use of materials from the soft leather to the real wood it’s a great place to spend time. The uncluttered facia design just oozes quality; my personal favourite is the stop start button – instead of pressing the button, you twist the knob to start the car, I know it’s a simple thing but it kept me happy. There is plenty of room for the driver and passengers alike. The Bowers &Wilkins speakers were excellent, they pump out 1400 watts from the 19 speakers and I’ve never heard Drake and Rihanna sound so good in my life. The chassis is very comfortable – the ride is very relaxing but it isn’t as agile as the 5 series or the Jaguar XF. The Volvo is a very refined long distance cruiser. Around corners and bends, it isn’t quite as fun as either the BMW or the Jaguar. The large alloys spoil the ride quality but they fill the wheel arches – knowing all of this I would opt for the large alloys all day long. Volvo have always been pioneers of safety and technology and their latest innovation is Pilot Assist. This system works at speeds up to 20mph. It’s not fully autonomous but you have to keep your hands on the wheel and the car can keep you in the right lane and it watches out for any forthcoming hazards. It is semi-autonomous and it takes the strain out of busy commutes. This car is a real breath of fresh air in this segment and the car’s interior is one of the best around right now. Volvos still feel like they are tanks, the doors close with a reassuring clunk and I do think anyone who is in the market for something a bit different should not hesitate to give this great car a chance.